The rise of Robotic Process Automation (RPA) is nothing short of spectacular. It has captivated the attention of digital operations executives with the promise of cost-savings beyond labor arbitrage, cost avoidance by extending the life of legacy IT, quicker implementation than traditional IT projects, business-user friendliness, auditability and compliance, straight through processing, and let’s be honest – terrific marketing. In fact, our research across 250 executives from the Global 2000 indicates that RPA is the #1 focus for enterprises to achieve their cost-saving goals (see Exhibit 1 and keep in mind that the chart indicates mind share, not wallet share). However, confusion around RPA deployments is also rife. There are growing questions as to whether RPA can deliver on the promised ROI and outcomes. Most RPA initiatives continue to be small and piecemeal. Truly scaled RPA deployments are rare. The industry is still struggling to solve challenges around the process, change, talent, training, infrastructure, security and governance…and satisfaction with RPA deployments is middling. Over 40% of the companies we surveyed were not satisfied with their RPA implementations. What is the current level of focus in the following technologies to help you achieve operational cost saving goals? With the mission to demystify this confusion and uncover the truth to successful RPA deployment, we conducted a first of its kind RPA CX research. We interviewed over 100 clients across 12+ RPA products and benchmarked CX across six dimensions and 40 sub-dimensions. The results (see Exhibit 2) were eye-opening. Overall RPA Client Experience has been 'Good.' The aggregated average CX scores across all six assessment dimensions are three on a scale of 4 implying a good overall experience. For most clients, RPA has created value in addition to reducing costs (just not as much and as fast as they heard in the first sales pitch!). For almost all the RPA products assessed, security, controls, accuracy, integration, and out-of-the-box functionality performs as promised. Basically, RPA works! Getting RPA “production ready” is not as easy as promised. The client experience with the amount of coding/configuration required is rated amongst the lowest. Management of version control and upgrades as well the training and support offered by RPA providers was also sub-par. The primary reason behind this is a classic expectation mismatch – the RPA providers oversold and overpromised, raising the client expectations beyond normal, that then resulted in less than required client investments towards process and change management. The disappointment associated with RPA is not about technology. RPA is not very smart (at least as of today). 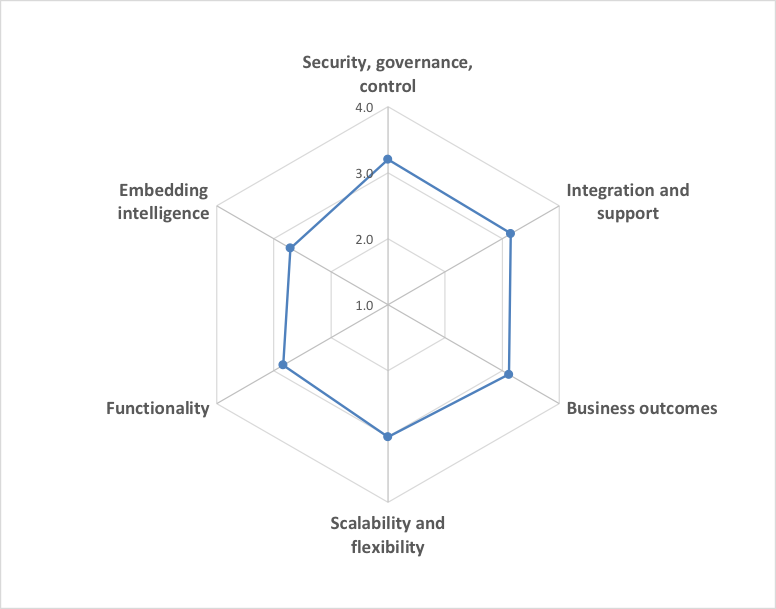 The dimension around embedding intelligence in RPA was rated the lowest by clients. There is considerable confidence in RPA’s ability to process structured data but drops down significantly when asked about unstructured or even semi-structured data. Clients are not convinced about the Artificial Intelligence (AI) capabilities of their RPA products. The good news is that most RPA providers recognize this and are investing in building out capabilities especially around Machine Learning (ML). At HfS, we believe that the holy grail of service delivery will be at the intersection of the Triple-A Trifecta – Automation, AI, and Analytics. Bottom-line. Rest assured that RPA works, but it will not work on its own. Like every other change, you will need to invest time, thinking, effort, and money to make your RPA deployments successful. Unfortunately, there are still no short-cuts to success! If you are interested in sharing your experience with RPA and contribute to our ongoing research, please take this brief survey. All entries are confidential, and the survey will not take more than 15 mins of your time. HfS Research and SIG are partners dedicated to delivering global research, insight and develop a portfolio of initiatives to benefit members and subscribers alike. Saurabh Gupta is Chief Strategy Officer at HfS. He oversees HfS’ global research function managing the global team of analysts across US, Europe, and Asia-Pac. He works closely with the CEO to set the strategic research focus and agenda for HfS Research, understanding and predicting the needs of the industry and ensuring that HfS maintains its position as the strongest impact thought leader for business operations and services research. He is a recognized thought leader and passionate problem solver in the global services industry. With 15+ years of experience across client, provider, advisory, and analyst roles, he brings a uniquely realistic and wide-ranging perspective to our industry’s challenges and opportunities. Before joining HfS, Saurabh led strategy for Genpact’s CFO and transformation services, helped shape the Business Process Services (BPS) strategy for AbbVie, managed Everest Group’s global BPS practice, and worked as a techno-functional consultant at Infosys. Saurabh advises senior executives on business transformation initiatives with a strategic mindset and execution orientation. He has authored over 125 research reports, is a frequent speaker, and is regularly quoted in industry publications. He is well-known for spotting disruptive trends like As-a-Service, Cloud, Analytics, Robotics and predicting their implications for different stakeholders. He brings to the table a combination of subject matter expertise and structured thinking with effective collaboration and communications. Saurabh is a Mechanical Engineer from Delhi College of Engineering and MBA from IIT Bombay. He lives in Chicago with his wife and daughter. He is a fan of Indian cricket and European soccer but is still trying to comprehend American football.